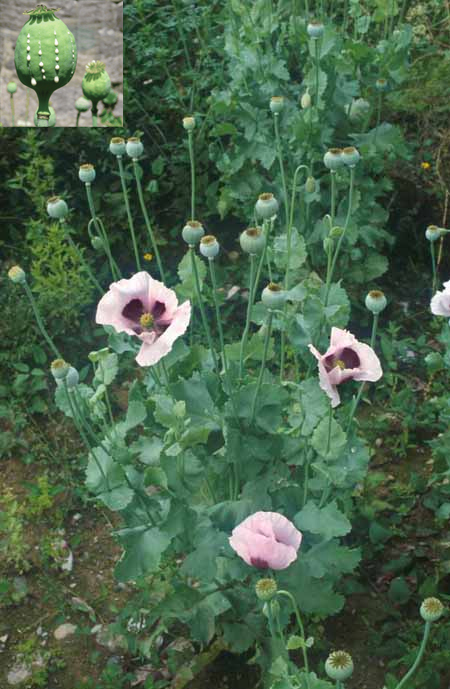 Common Name: Opium poppy capsule, Poppy capsule. Properties & Taste: Sour, astringent, neutral and toxic. Meridians: Lung, large intestine and kidney. Functions: 1. To astringe the lungs; 2. To stop pain; 3. To astringe the intestines. 1. Chronic cough due to deficiency of the lungs. Poppy capsule (Yingsuqiao) is used with Black plum (Wumei). 2. Chronic diarrhea or chronic dysentery. Poppy capsule (Yingsuqiao) is used with Costus root (Muxiang), Coptis root (Huanglian) and Dried ginger (Ganjiang). 3. Pain. Poppy capsule (Yingsuqiao) is used alone for the treatment of pain. Dosage: 3-10 g (Fried with honey, the herb is used for cough; prepared with vinegar, for diarrhea with pain.). Cautions & Contraindications: This herb is contraindicated in the early stage of cough and dysentery. Care should be taken to avoid overdosing.